Cove went down 3-2 on aggregate after a controversial winner from Cowden and in injury-time there was an unsavoury melee involving all 22 players with the exception of Cove keeper Stuart McKenzie. Reflecting on an afternoon of mixed emotions, Mathieson said: “The big prize for us last Saturday was to try and get into the Scottish League and we just didn’t quite make it, the feeling within the club being that we were pretty much mugged. “There’s not a lot we can do about that now, it’s now a case of having a few weeks’ break before looking forward to another season in the Highland League. “So we go again in search of that big prize by winning the Highland League before trying to progress again. “We will prepare for next season in exactly the same way as we always do, but the experience we gained at Central Park will bring its own positives. The first time we reached the play-offs we were beaten in the first game by Edinburgh City, but we learned from that experience. 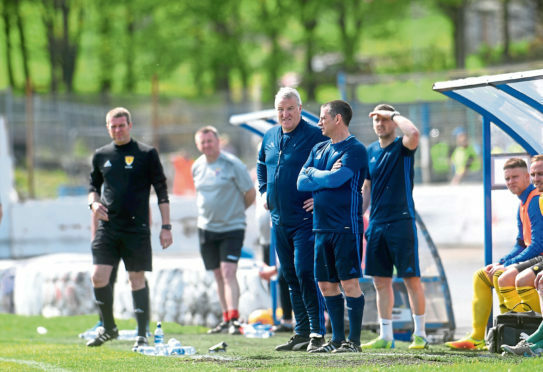 Mathieson reckons the odds are heavily stacked against a Highland League club being promoted, and added: “It’s going to be very difficult thing for a club from the north to do it, but we will all keep trying. “Even when we arrived at the ground on Saturday we felt that the odds were against us, especially we watched how the officials interacted with their players. “Having said that I think we went out and played well in the first half, and deservedly went in 2-1 up, then we lost a strange goal and after that things seemed to go from bad to worse, and what happened at the end was pretty unbelievable.